Earlier this month, Graphicsland was contacted by a longstanding customer seeking support for a cause that very close to his heart. Nine months ago, his son lost a devastating battle with mental illness, and just a few months later his eldest son Ian set out to do everything he could to raise awareness of this terrible sickness that affects untold millions across America. “Every month we like to pick a charitable cause to support in any way we can. 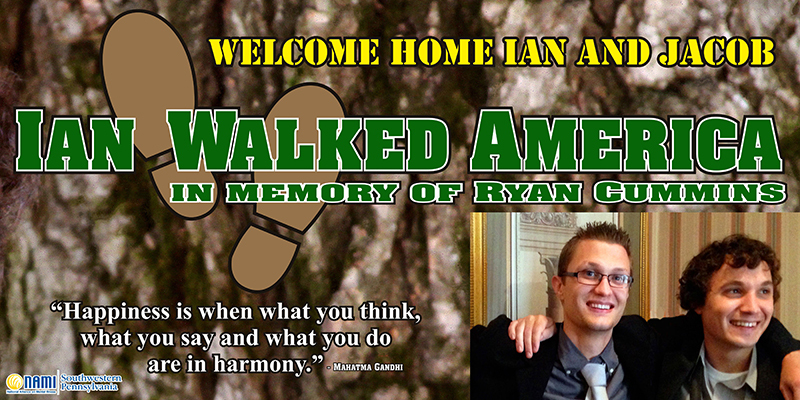 This month we are working on behalf of Ian Walks America. Ian is doing everything he can to raise awareness of mental illness in memory of his younger brother Ryan whom he lost to mental illness last November.” said Jerry Feil, President of Graphicsland. Graphicsland is humbled to provide Ian’s family and friends with vinyl banners to welcome Ian as he crosses the Golden State Bridge in San Francisco, California completing his journey later this month. Along with the banner, Graphicsland is also providing bumper stickers to help continue bringing attention to Ian’s efforts and shine a light on the awful devastation that mental illness causes.